This review today is from blogger guest poster, Tracy. 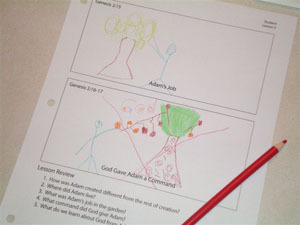 Several months ago I was privileged with receiving a GrapeVine teaching unit on their Old Testament Overview (from Creation to Babel). In the package were two smaller packages – a teacher’s pack of instructions and a student’s pack of worksheets (both hole-punched and ready to be inserted into a binder). I excitedly opened both packages and prepared my binder for use. (As I am using it with my 4 year old, I am retaining responsibility of the binder myself.) I keep the teaching resources in the first part of the binder and his worksheets in the back part. As we go through the lessons I pull out the sheet that he is working on, then flip to my little paperclip marking the current teacher page and keep that open as I guide the lesson. 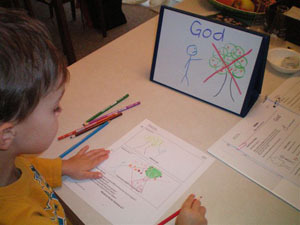 I was fortunate enough to find a fold-up mini-whiteboard made by Magnetic Learning second hand. I can’t seem to find it on their website, but this one looks similar: http://www.amazon.com/Sanford-1763773-Foldable-Board-Tabloid/dp/B004I2H644 . I also found a package of coloured dry-erase markers that are perfect for the GrapeVine drawings. Each lesson (10 in the Old Testament Overview) is made up of four mini-lessons which you can do over the span of four days or all at one time. They are short and sweet, making it so manageable to start a routine AND KEEP IT! 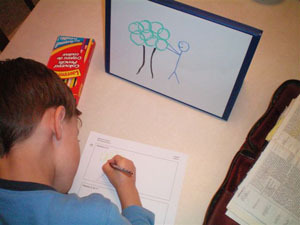 Depending on how much time you allow your child to have to draw, it could take anywhere from two minutes to “That’s long enough, we’re moving on!”. With every lesson (four mini-lessons) a memory verse is suggested. I, however, chose to work on one memory verse for every two lessons (or eight mini-lessons). There is also a set of review questions you can go through orally after every full lesson. Midway through there is a “Section Review” (30 questions) and at the end a “Final Review” – a repeat of the Section Review questions and an additional 20 to represent the last half of the entire unit. We really enjoyed our time with this curriculum. I really see this product becoming a tool we come to again and again. I would not hesitate at all to recommend this program…actually I’d eagerly suggest it! While we have not yet purchased our next unit, I am confident that it will find its place in our permanent line up of school products. Visit GrapeVineStudies.com to get more information. This entry was posted in Reviews, Uncategorized on January 18, 2013 by Krista G..